Lignocellulosic Biomass to Liquid Biofuels explores the existing technologies and most recent developments for the production of second generation liquid biofuels, providing an introduction to lignocellulosic biomass and the processes for its conversion into biofuels. 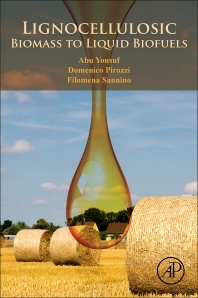 The book demonstrates biorefinery concepts compared with petro refinery, as well as the challenges of second generation biofuels processing. In addition to current pre-treatment techniques and their technical, environmental and economic implications, chapters included also further examine the particularities of conversion processes for bioethanol, biobutanol and biodiesel through chemical, biochemical and combined approaches. Finally, the book looks into concepts and tools for techno-economic and environmental analysis, which include supply chain assessment, by-products, zero-waste techniques and process evaluation and optimization. Lignocellulosic Biomass to Liquid Biofuels is particularly useful for researchers in the field of liquid biofuels seeking alternative chemical and biochemical pathways or those interested advanced methods to calculate maximum yield for each process and methods to simulate the implications and costs of scaling up. Furthermore, with the introduction provided by this volume, researchers and graduate students entering the field will be able to quickly get up to speed and identify knowledge gaps in existing and upcoming technology the book’s comprehensive overview. Abu Yousuf holds a PhD in Chemical Engineering from the University of Naples Federico II, Italy. His primary research interests include Biorefinery, Bioenergy, Bioremediation and Waste-to-energy. One of his renewable energy projects won ‘International Invention of the Year Award’ at British Invention Show (BIS) 2017, London. He published more than 50 papers in reputed ISI and Scopus indexed journals and 5 book chapters. He has been editing 3 Books, published by Elsevier and CRC and also has been serving as an editorial board member of several reputed Journals. He won UNESCO Prize on E-learning course of ‘Energy for sustainable development in Asia’, Jakarta, Indonesia, 2011. He attended the ‘BIOVISION.Next Fellowship Programme 2013’ at Lyon, France, after a selection based on scientific excellence, mobility, involvement in civil society. He successfully accomplished 10 research grants including the grants provided by The World Academy of Science (TWAS), Italy, Ministry of Higher Education, Malaysia and Ministry of Science and Technology, Bangladesh. Dr. Yousuf is the member of IChemE, American Chemical Society (ACS), and American Association for Science and Technology (AASCIT). He has 12 years’ experience of teaching in undergraduate and postgraduate levels having very good remarks from the student. Currently, Dr. Yousuf is serving as a Professor in Chemical Engineering and Polymer Science, Shahjalal University of Science and Technology, Bangladesh. Previously he held the position of Senior Lecturer at Faculty of Engineering Technology, Universiti Malaysia Pahang, Malaysia. He presented his research work in Germany, France, Italy, India, Vietnam and Malaysia. Filomena Sannino holds PhD in Agricultural Chemistry from the University of Naples Federico II, Italy. His primary research interests include Bioremediation, Heterogeneous Catalysis, Bioenergy and Valorization of Agricultural Biomasses. She is founding partner of Spin-Off GreenAmbioTech s.r.l. She is author of the patent Process for producing triacetylhydroxytyrosol from olive oil mill waste waters for use as stabilized antioxidant” De Martino A., Sannino F., Manna C., Gianfreda L., Capasso R. PCT/IT 2005/000781. She is a member of The Interdepartmental Research Centre on Nuclear Magnetic Resonance (NMR) for the Environment, Agroo-food and New Materials (CERMANU) of the University of Naples Federico II . She is also a member of Technical Scientific Committee for the “Food Security and New Technologies” Area, partnership between the Interdepartmental Research Centre "Laboratory of Urban and Regional Planning" (LUPT) of University of Naples "Federico II" and European Parliament. She has published 83 papers in ISI indexed journals and several book chapters. Dr. Sannino Filomena is a member of Agricultural Chemistry Society and International Humic Substances Society (IHSS). She has 19 years’ experience of teaching for undergraduate and postgraduate students in Agricultural Biochemistry, Inorganic Chemistry, Use and Recycling of Agricultural Biomasses, Plant Biotechnology for Environmental Phytoremediation, Biochemistry of Plant Hormones and Growth Regulators. Currently, she is a researcher in Agricultural Chemistry at Agricultural Sciences Department of University of Naples “Federico II”.